California companies must now actually make their products in the U.S. to call them American-made. 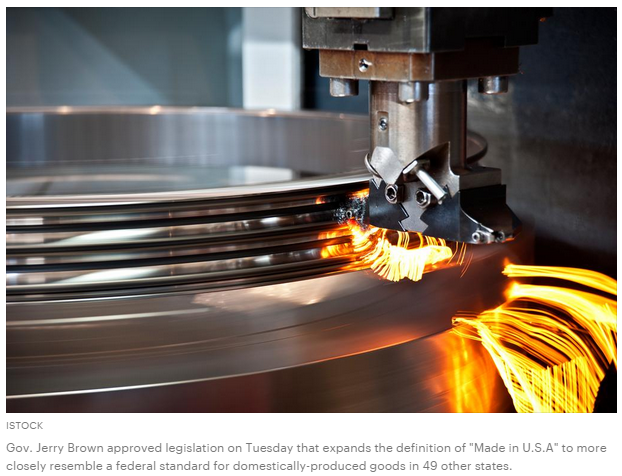 That federal standard requires that “all or virtually all” of a product’s parts be manufactured domestically and that its final assembly must occur within the U.S. The federal government does not specify how much must come from the U.S.; products are evaluated case by case. Up until now, California has applied its own, more literal “Made in U.SA” labeling standard that is impractical and puts in-state manufacturers at a marketing disadvantage, said Sen. Jerry Hill, the bill’s author. The legislation “fixes this problem and brings California’s labeling statute into the 21 st century, helping to promote California manufacturing and jobs,” said Hill, a San Mateo Democrat, in a statement. He added that this kind of flexible definition is not a foreign concept in California: A “Made in California” label is legally valid as long as 51 percent of a product is made in-state. California wine can advertise itself as hailing from a certain region, like Napa or Lodi, as long as 75 percent of the grapes are produced there. Hill is unaware of any study showing the economic impact of a “Made in U.S.A” label, but his office provided a 2013 survey from ConsumerReports.org that found 60 percent of respondents said they would pay up to 10 percent more for American-made goods, and 25 percent said they would pay an extra 20 percent. California’s new law, Senate Bill 633, stipulates that makers of California goods can use “Made in U.S.A” if at least 95 percent of the parts are manufactured domestically. The threshold approved Tuesday replaces a 1961 state law that HIll said was approved in a pre-globalization era to protect American producers from foreign competitors with misleading labeling. The California Manufacturers and Technology Association and other business groups disagreed, arguing that a revised law was needed for California to stay competitive in a global marketplace.